For some, prayer seems like a mysterious or pointless endeavor. Others practice it regularly, but wonder if it makes any difference. Is there power in prayer, and if so, how can you discover it? Some days can be difficult. Some days can be very difficult! We all have had those kinds of days. For some they come more often than others, it seems. There is something you can do to make those days a little easier, perhaps even happen less often. Anciently, soldiers would put on armor to give them protection from deadly blows. And there are things we can do at the beginning of each day that will help us in a similar way (Ephesians 6:10-11; “Put on the Armor of God”). One of those is prayer. Many have made this a part of their daily routine. They have found that there is a power greater than ours that is available to help us have extra wisdom and guidance in making better decisions and to strengthen us to make it through those difficult days. There are many biblical examples of men and women who sought God’s help in prayer. David, who had his share of troubles, prayed often. “Evening and morning and at noon I will pray, and cry aloud, and He shall hear my voice” (Psalm 55:17). David spoke of the availability of God’s help in times of stress. “Cast your burden on the LORD, and He shall sustain you; He shall never permit the righteous to be moved” (verse 22). A lot of people never pray. Some are not sure how to go about it if they decide to. There are others who pray and feel they don’t get any results or answers. And among those who do pray, many pray in very different ways. Some read prayers or use memorized prayers. Others seem to feel they should speak in a very sanctimonious tone of voice when they pray or use what they feel are biblical words, such as thee and thou. A lot of people never pray. Some are not sure how to go about it if they decide to. There are others who pray and feel they don’t get any results or answers. Jesus’ disciples were from a Jewish background. Regular prayer was a part of their religious culture. Yet after hearing Jesus Christ pray and after talking with the disciples of John the Baptist, they concluded that perhaps they could do better. “So He said to them, ‘When you pray, say: Our Father in heaven, hallowed be Your name. Your kingdom come. Your will be done on earth as it is in heaven. Give us day by day our daily bread. And forgive us our sins, for we also forgive everyone who is indebted to us. And do not lead us into temptation, but deliver us from the evil one’” (Luke 11:1-4). Prayers should be in our own words and thoughts, from our own feelings and what is in our hearts. They should express our adoration, respect and appreciation of God as well as our requests for our personal needs. On another occasion, Jesus had shown them that the majority of their prayers should be private and not repetitious. “And when you pray, you shall not be like the hypocrites. For they love to pray standing in the synagogues and on the corners of the streets, that they may be seen by men. Assuredly, I say to you, they have their reward. But you, when you pray, go into your room, and when you have shut your door, pray to your Father who is in the secret place; and your Father who sees in secret will reward you openly. And when you pray, do not use vain repetitions as the heathen do. For they think that they will be heard for their many words. Therefore do not be like them” (Matthew 6:5-8). “Where do wars and fights come from among you? Do they not come from your desires for pleasure that war in your members? You lust and do not have. You murder and covet and cannot obtain. You fight and war. Yet you do not have because you do not ask” (James 4:1-2). The first problem James mentions is a failure to ask. 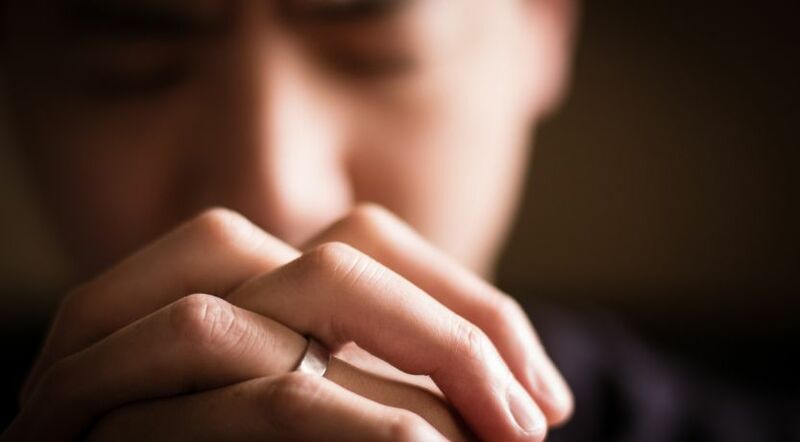 A survey by Pew Research revealed that one in three between the ages of 18 and 29 seldom or never prays, and of that age group only one in 10 prays “at least daily.” The percentages were higher among the older groups, revealing a trend of declining use of prayer as a form of worship or communication with God. How can someone expect to receive anything from God, if he or she doesn’t ask? Christ said, “So I say to you, ask, and it will be given to you; seek, and you will find; knock, and it will be opened to you” (Luke 11:9). Jesus Christ is seated at the right hand of God as our High Priest to intercede for us. “Let us therefore come boldly to the throne of grace, that we may obtain mercy and find grace to help in time of need” (Hebrews 4:16). We all have our times of need. Whether our needs are big or small, we should know that we can go to Him for help. “In all your ways acknowledge Him, and He shall direct your paths” (Proverbs 3:6). One of the righteous women of the Old Testament was Hannah, who became mother of the prophet Samuel. She was a woman burdened with family difficulties along with not being able to have children. “And she was in bitterness of soul, and prayed to the LORD and wept in anguish” (1 Samuel 1:10). She fervently prayed to God, and God eventually answered her in a wonderful way. “So it came to pass in the process of time that Hannah conceived and bore a son, and called his name Samuel, saying, ‘Because I have asked for him from the LORD’” (verse 20). In the following years God blessed her with several more children. Even evil King Manasseh turned to God in a time of trouble. “Now when he was in affliction, he implored the LORD his God, and humbled himself greatly before the God of his fathers, and prayed to Him; and He received his entreaty, heard his supplication, and brought him back to Jerusalem into his kingdom. Then Manasseh knew that the LORD was God” (2 Chronicles 33:12-13). We must not ask something that is contrary to God’s will. It is also important that we submit to the laws He has given us to live by. Obviously, there are other factors that are important in receiving a positive response from God. We must not ask something that is contrary to His will. It is also important that we submit to the laws He has given us to live by. The second thing that James writes about is being selfish in our prayers. “You ask and do not receive, because you ask amiss, that you may spend it on your pleasures” (James 4:3). Sometimes people focus on what they want without acknowledging the many things they already have and first giving God thanks for those. “Be anxious for nothing, but in everything by prayer and supplication, with thanksgiving, let your requests be made known to God” (Philippians 4:6). Again, “Continue earnestly in prayer, being vigilant in it with thanksgiving” (Colossians 4:2). Our prayers shouldn’t just be about ourselves. We should ask God to help and intervene for others also. Job prayed for his children (Job 1:1-5). Even though the Israelites criticized Moses’ leadership, he still prayed for God to be merciful to them (Exodus 32:11-14). The apostle Paul reminded the hundreds of brethren he wrote his letters to that he prayed often for them. “For this reason we also, since the day we heard it, do not cease to pray for you, and to ask that you may be filled with the knowledge of His will in all wisdom and spiritual understanding; that you may walk worthy of the Lord, fully pleasing Him, being fruitful in every good work and increasing in the knowledge of God; strengthened with all might, according to His glorious power, for all patience and longsuffering with joy; giving thanks to the Father who has qualified us to be partakers of the inheritance of the saints in the light” (Colossians 1:3, 9-12). He went on to say in a letter to Timothy, “Therefore I exhort first of all that supplications, prayers, intercessions, and giving of thanks be made for all men, for kings and all who are in authority, that we may lead a quiet and peaceable life in all godliness and reverence. For this is good and acceptable in the sight of God our Savior, who desires all men to be saved and to come to the knowledge of the truth” (1 Timothy 2:1-4). The Father would love to hear from you! Parents appreciate it when their children confide in them, seeking their guidance and help. So does God when we, His children, go to Him in prayer. “The sacrifice of the wicked is an abomination to the LORD, but the prayer of the upright is His delight” (Proverbs 15:8). He is there for us to call upon. Will we miss out on something good because we failed to ask? Don’t limit the power of prayer; your life will go better if you regularly pray to the Creator. Learn more about the power of prayer in our study guide How to Pray.